Today Herculane is a popular tourist destination for the same reasons, and every spring, just before the Orthodox Easter, the Romanian yoga school MISA holds a spiritual yoga holiday camp there. 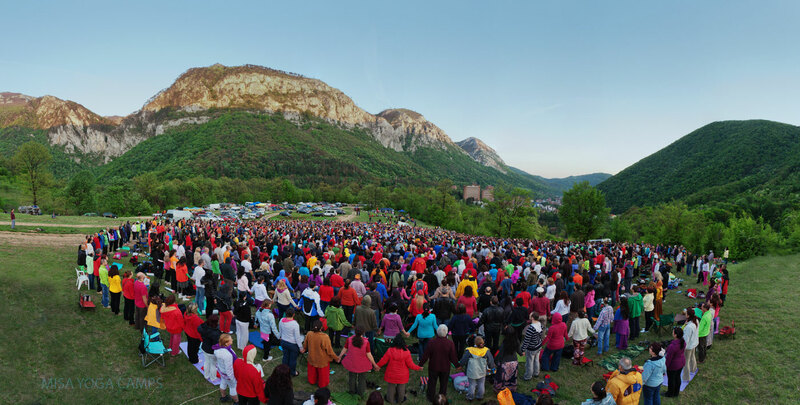 The camp attracts thousands of yoga practitioners from around the world for 10 days of meditations, conferences, initiations and other spiritual activities. It’s also a wonderful opportunity to catch up with friends, trek through the mountains, visit the thermal springs, lie about in the sun, eat as many “cartofi prajiti-s” as possible (delicious Romanian french fries made with REAL potatoes) and to just have fun! For me this was the first taste of spring for the year, or should I say summer! as the temperature was pushing 30 and only one layer of clothing was required! It was time to finally dust off my thongs… (No that is not a typo..see previous article: Spring Equinox… for important clarification). One of the highlights was the yang spiral meditation on April 27th. This meditation is one of the most efficient techniques of group meditation regularly practiced in MISA yoga school. The spiral is formed in the order of the zodiac from Aries to Pisces, alternating man and woman. The formation is in a yang direction which means the energies that are amplified are predominantly of a yang nature, increasing states of energetic control, inner centring and focus within the practitioners. For me, the consequence of these meditations is nothing short of exceptional, as they help to transcend the limitations of the usual discursive mind and to elevate the consciousness to a superior level, increasing our vibrational frequency and sharpening the perceptions. Here is a brilliant video clip showing how the spiral is made and the final formation in which we all meditate. Especially when done together with thousands of other people, the results of the yang spiral meditation are extremely profound and the ripple-effect can be felt long after in the daily life. If you ever get the chance, I highly recommend! During the camp I also participated in the Atman international yoga teachers’ meeting together with my dear friend and teacher, Advaitananda. This important meeting brings together many advanced practitioners from all over the world to share their experiences, ideas and visions as teachers of the Atman yoga system. It is always a heart-warming experience to be a part of these gatherings in which the futures of all the yoga schools in the federation are shaped on an international scale. To be able to share in the triumphs and joys of other teachers, both on a personal and collective level, is a great gift, and very inspiring. Even though I did not participate much in the camp program this year, just being there in my beloved Romania, in the deeply regenerating mountains, and in the soul-enlivening field of the spiritual camp, gave me such an amazing state of inner-fulfillment and revived my spiritual aspirations that I now bring with me into my life up here in the far north.